Despite the many advantages that come with using composites materials in aerospace applications, designing weight-bearing structures from these materials remains a significant challenge. Compared to legacy metals, multi-material, multi-ply composites remain much more mathematically complex to model and design. That said, computing tools have improved dramatically over the past 10-15 years, enabling composites analysis, simulation and optimization to be carried out more quickly and accurately. These more sophisticated digital tools also have enhanced the ability of engineers to design for optimum weight reduction, as well as to refine manufacturing processes on the shop floor — significantly cutting time and cost. This led directly to greater acceptance and deployment of composites and enabled the production of the larger, lighter aircraft we see today. No matter the aircraft or the materials used to make it, manufacturers have a common goal of reducing the total project schedule, from kickoff to FAA certification. Yet, adding composites into the product development equation can introduce greater complexity because so many processes are brought together — design, analysis, testing, curing of the laminate, the robotic application of the fiber on the tool, etc. Further, each of the assembled technologies needs to be in communication with the others on which they have an impact: How a laminate is designed or optimized affects every other downstream function, so passing the data more efficiently between disciplines is critical. As design iterations progress, a tight feedback loop is essential to achieve a fully optimized composite design. OEMs that work with composites are increasingly aware of how significantly early design decisions affect the downstream efforts of the manufacturing team to produce a final, certifiable part. The technology continues to mature, but software developers and part designers are already identifying the “sweet spots” where processes can be automated and improved upon. Although composites are still in the relatively early stage of adoption in aerospace, we’re at the point where we are able to take lessons learned and apply them to improve processes with measurable results. Analysis traceability and visibility are highly important for certification so, on the pathway to achieving it, an OEM must prove to the US Federal Aviation Admin. (FAA) that it has done its due diligence. Every aircraft manufacturer must prove flight-worthiness of each proposed aircraft configuration, so there can be no ambiguity in the structural analysis process. It must be fully traceable and repeatable. It’s unacceptable to use a “black box” of computational tools. Strong support for an OEM’s submission for certification can be provided by finite element analysis (FEA) output files of computed internal loads with, for example, NASTRAN or Abaqus — along with test data that validates methods and allowables. Software tools are now available to automate the processes that provide these, giving the design engineer the ability to trace through the analyses, visualize the results and understand the response of a composite structure, thereby confirming that the software and material input data are producing the correct answers. Templates of a wingskin, a rib or a fuselage (Fig. 1) guide the user through the analysis. The software reports to the engineer all the analysis details, including input and intermediate data results, with stress methods fully documented by references to the published literature. The test/data correlation capability enables the user to store such data for later demonstration of the agreement between analytical prediction and test. Collier Research’s HyperSizer software, for example, can now automate the setup of a design/feedback loop, based on the internal-load data from whatever number of FEA load cases (these can be numbered in the thousands) are needed to reach an optimized design — and then compute the failure margins of safety (Fig. 2). At this point, the final deliverable from the software is an updated design to pass to the user’s CAD software (such as CATIA), updated model properties to pass to the global loads model, and stress reports. The attraction of lighter aircraft, and the fuel savings that result, of course, are the major reasons why OEMs are increasingly turning to composites, but this obviously must go hand in hand with meeting all safety criteria. 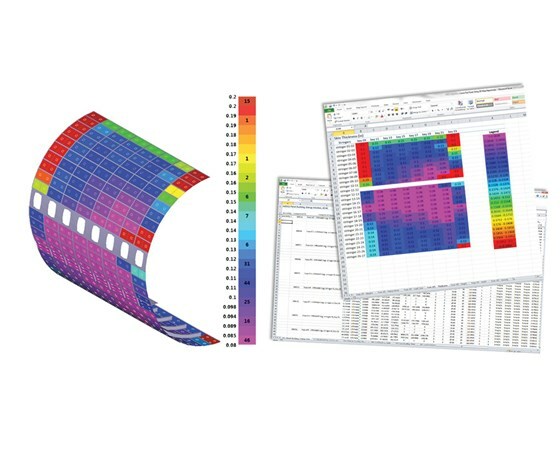 Our design and analysis software, for example, not only builds a positive margin of safety into every load-case run, but it also optimizes the composite design for the minimum weight that meets all applicable failure criteria with positive margins. Typical weight savings can run between 20% and 40% — and this also provides a marked reduction in material costs for the aircraft manufacturer. As product development moves from the design stage to the manufacturing phase, digital tools can continue to play an important role. 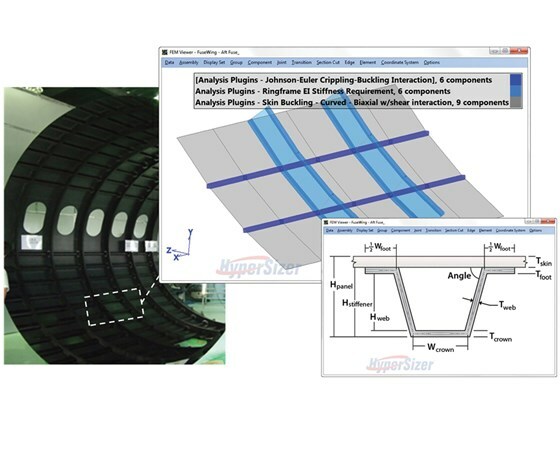 For example, laminate designs can be automatically incorporated into composite layup simulations in CAD. In preparation for this hand off, HyperSizer identifies the optimized ply schedules for a part, then sequences these further to account for layup producibility requirements. The ply schedules are then passed to the CAD software for ply staggering and generation of part drawings. This is the sequence now employed by some major aircraft makers today. Many aerospace companies are still spending a great deal of time performing their stress analysis and sizing in error-prone spreadsheets or custom scripts instead of making use of the commercial software. Our software can replace those scripts with automated stress analysis/sizing that quickly updates the FEA model and CAD layup schedules with every change to the design. This kind of software automation can reduce a design schedule from many months to a few weeks. And in the long term, the ability to call up and repeat a digital analysis on an aircraft at any point in its 30- to 50-year lifespan — one that can extend beyond any individual engineer’s career — is of obvious benefit. Keeping design models viable also will be key as Industry 4.0 becomes reality and the link between the composites design process and subsequent manufacturing becomes increasingly automated.